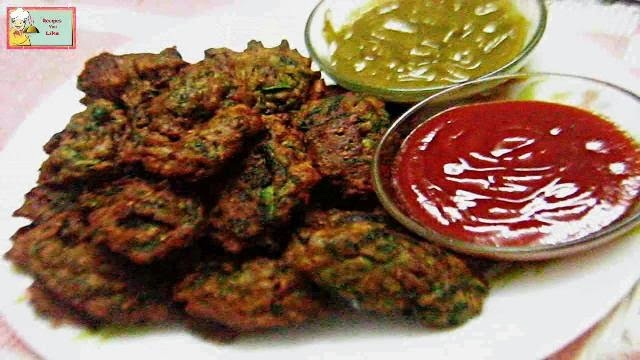 Palak Pakore or Palak Pakoda is a crispy spinach fritter Indian recipe. Its served as a starter or a tea time snack especially during the winter days or in rainy evenings. Spinach shopped is dipped in chickpea flour mixed with some flavored spices. 2. Then mix all the above ingredients into a paste like consistency. 3. After this mix in the chopped Palak to form a batter not so thin and not so thick. 4. Now take a teaspoon full of the batter and drop it in the hot Oil. 5. Fry in batches, about 6 to 8 tsp at once. 6. Tilt on upside down till golden brown in color. 7. Strain out over a paper towel and serve hot with your chosen dip. • Fry on low to medium heat so they don’t remain raw inside. • Drop in the batter only when the oil is perfect hot, otherwise the batter might stick below. • To check if the oil is perfect hot ,drop a small portion of the batter in the oil and if you see bubbles coming out this indicates the oil is right for frying. • Instead of refrying the fritter to make them more crispy (Its very unhealthy) its better to pop them in oven for sometime before serving if you need to make them in advance.